You are browsing the archive for Annual General Meeting. 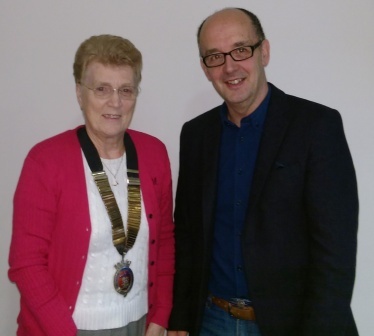 We are delighted to announce that Pam Haworth was elected as President of the Association for the next two years at the AGM on Saturday 12th December. The Haworth family has thrown itself into the sport of swimming and all members have been active enthusiasts in the aquatic disciplines. All began their involvement with Preston SC in the 1970s and supported the club across the disciplines. Pam herself is a well-known and highly regarded personality in Synchronised Swimming. Her late husband, Craig, was involved with swimming and synchronised swimming and a technical official in both disciplines. Son Paul has been actively involved in water polo for many years as a player and a coach and as well as coaching club teams he also coached several Northern Counties and Regional teams with great technical insight and aplomb. Daughter Fiona was a top British international synchronised swimmer in her own right and won a medal at the European Championships and competed for Great Britain on several occasions and was Northern Counties solo champion from 1990 and duet champion from 1988 until the Northern Counties finished in 2005. She has since gone on to become a top coach and choreographer in her own right. Wanting to put something back into the sport herself and in addition to her club responsibilities Pam was elected to the Northern Counties ASA Synchronised Swimming Committee in 1986 and became its Hon Secretary four years later succeeding Irene Williams who had been the founder secretary and she also went on to succeed Irene as the ASA Synchronised Swimming Committee secretary in the 1990s for almost ten years where she was responsible for managing the discipline and organising the national championships. It is fair to say that there is no better Synchronised Swimming Championships than one that Pam has organised. In 2002 she was appointed the Competition Manager for the Commonwealth Games in Manchester and organised a fantastic celebration of Synchronised Swimming there. That same year she was awarded the Mary Black Award for services to Synchronised Swimming by the ASA. In 2003 she set up the City of Preston Aquatics Club so that Synchronised Swimming could maintain its position and keep going as the Preston SC re-organised. She has been a member of Lancashire County Executive Committee for many years and once she joined immediately pushed successfully for the inclusion of Synchronised Swimming within the County’s activities. For her services to the sport in this area she was selected as the ASA North West Region President for 2009-10 having been nominated by Lancashire County. She is thus one of the very few people in any region who will have been Regional President before County President but Pam is no stranger to being unique! The Annual General Meeting of Lancashire County Water Polo & Swimming Association will be held on Saturday 12 December at the Holiday Inn Express Leigh Sports Village, Sale Way, Leigh, WN7 4JY, Tel: 01942 366334. Coffee and tea served from 10:30 am. Meeting to commence at 11:00 a.m. The Annual General Meeting will be held on Saturday 12 December 2015 10:30 am for 11:00 am start. at the Holiday Inn Express (previously Park Inn), Leigh Sports Village, Sale Way, Leigh, WN7 4JY (Tel: 01942 366334).